The JBFC is proud to join the Romanian Film Initiative in copresenting the 12th edition of Making Waves, the longstanding Romanian Film Festival in New York. 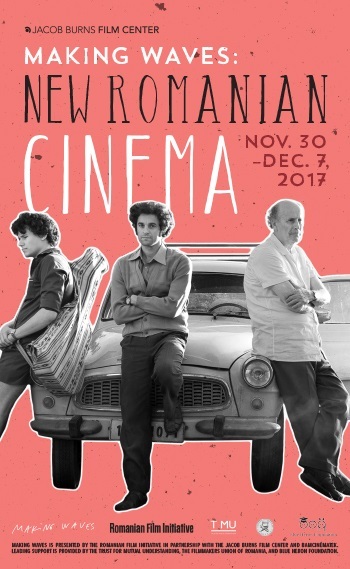 Cofounded in 2012 by Corina Suteu, Mihai Chirilov, and Oana Radu, the independent Romanian Film Initiative aims to preserve and enhance the festival’s critical and creative spirit. This survey has “helped define and establish the southeastern European country as a stronghold of socially incisive, independently minded personal cinema” (Wall Street Journal). With standout titles such as Sieranevada, Graduation, and Dogs, 2016 was a great year for Romanian cinema. Taking the next step, 2017 sees the return of audience darling Nae Caranfil, who gets to open this year’s festival with his new musical extravaganza, 6.9 on the Richter Scale. International film festival highlights such as Adrian Sitaru’s The Fixer (Toronto), Calin Peter Netzer’s Ana, Mon Amour (Berlin), and Iulia Rugina’s Breaking News (Karlovy Vary) join the party, adding to the mix the convoluted relationships and morally charged dramas that we have come to expect from most New Romanian Cinema hits. And so does a contingent of promising first-time filmmakers: Anca Miruna Lazarescu with her highly enjoyable Iron Curtain dramatic comedy The Trip We Took with Dad, the duo Cosmin Bumbut and Elena Stancu with their exquisite piece of anthropological cinema The Last Kalderash, and Serban Georgescu and his mordant social satire Cabbage, Potatoes and Other Demons. This year’s program is a hell of a ride, with The Gambler by Ignas Jonynas equally on board—courtesy of this edition’s guest country, Lithuania. With its dash of black humor, it could easily pass as Romanian. Enjoy! Mihai Chirilov is a film critic and has been artistic director of the Romanian Film Festival in New York City since 2006. He is also artistic director of the Transilvania International Film Festival, which he cofounded in 2002 and guided to European prominence. Making Waves is presented by the Romanian Film Initiative in partnership with the Jacob Burns Film Center and BAMcinématek. Leading support is provided by The Trust for Mutual Understanding, the Filmmakers Union of Romania, and Blue Heron Foundation.